Redbox, which rents DVDs, Blu-ray discs, and video games from their familiar bright red kiosks, exited the streaming video business when they shut down their Redbox Instant by Verizon service in 2014. We reported in August that Redbox was testing a re-entry to video streaming with an invitation-only service called Redbox On Demand. 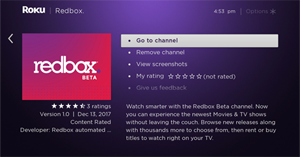 That test must have gone well because Redbox is now extending their beta service to all Roku users, and users of several other streaming platforms. Redbox called the previous test "a closed beta, which means we're testing the basics, like functionality, with a limited number of people. As we test and learn from our customers, we will make evaluations that determine any future course of action for the service." Part of that closed beta included testing on Roku with a private (also called non-certified) Roku channel. Only invited beta testers were able to buy and rent videos through this channel. This week Redbox has launched a wider beta on iOS, Android, Apple TV, Chromecast, Roku, LG TVs, Samsung TVs, and the Redbox website. (On Roku, the Redbox channel can be found here.) The service does not require a subscription, but lets you buy or rent videos. Rentals are good for 48 hours once you start streaming, but you have 30 days after renting before you have to watch it. Account information is transferable across different platforms so you can start watching on one device and finish it on another. Rental and purchase prices vary depending on the popularity but typically run between $2.99 to $4.99 for film rentals and $14.99 to $17.99 for movie and television series purchases. More information on the channel, including screenshots, can be found on our Redbox channel page.